Dèesse Magazine: Maybelline SUPERSTAY BETTER SKIN FOUNDATION x Influenster #BetterSkinChallenge + Review ! 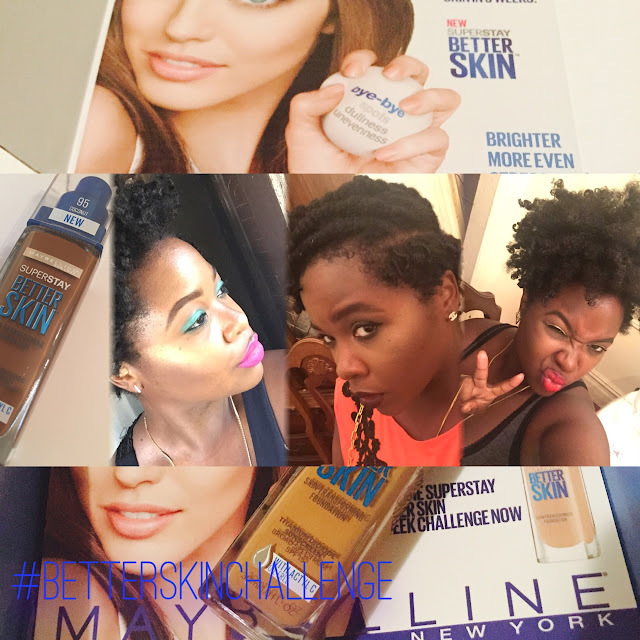 Maybelline SUPERSTAY BETTER SKIN FOUNDATION x Influenster #BetterSkinChallenge + Review ! I was lucky enough to be chosen by Influenster to review the Maybelline SuperStay Better Skin Foundation. , and also take part in the "Better Skin Challenge" - where you wear the foundation for three consecutive weeks to see visible changes in yout skin. I was excited as besides the BB Cream , I have not ever used / tried a Maybelline liquid Foundation. I was sent the color "90" - Warm Honey for free to review ( pictured in Week 1) , and it was a bit light for me ( partly because I've tanned a lot in the past couple of weeks.) . I then said, okay I'll use it as a highlighter - but there's absolutely no way I could make this light color work for three weeks on my full face. I will say though , after the first application ( washing it off I felt a smoothness in my skin). By Week 2 ( the perks of being a Beauty Blogger - I got the deepest shade "95" - Coconut ( pictured in Week 2 and Week 3 ) sent to me by Maybelline ( thanks again!). This shade was perfect ... It give me the full coverage I like , but I could go light as well. I even used some to spot conceal under my eyes - and I loved the results. My skin looked flawless and it felt good which was even more important. I think in the Week 3 photo my skin looks the most clear and even toned - its pretty visible ( even though I am a bit darker due to my time in the sun.). The one issue I have is availability of Deep tones in store . I did some research ( before I received my foundation from Influenster , and also when I wanted to get 95 ) , and a lot of the stores locally - Brookly NYC does not carry dark tones. The display , only featured the first 4 shades - there is a diverse group living in my area ( many women of color as well) , and it is sad we would not be able to easily pick up a bottle. Maybelline ( other brands as well) need to work on this . We buy makeup as much as our fair skinned counterparts and we should not have to feel left out at the drugstore. If this can be solved then I would have nothing negative at all to say. As a Blogger and Makeup Artist , I've tried many foundations - and this foundation rivals even surpasses some of my expensive luxury foundations. I already have a pretty great night routine before bed , but I can honestly say I love the way my skin looks with and without this foundation on. I am excited to see my results after 6 weeks of using this foundation - I would definitely advise anyone to try it.